What would a coil leaking look like? How can I diagnose that? I can think of 2 ways to see if L20 has leakage between the primary and secondary. One way is to see if it gets warm or hot after the set is running a few minutes. The other way is to disconnect the ground connection at the bottom of the secondary. If the plate voltage on V6 goes up and the signal level goes up then L20 would have leakage. That would disable the sound, but this would just be for testing the video. Such a problem in L20 would be unusual, but your lack of signal at V6 is unusual. I haven't seen the schematic section that has R58. reading between the two types of meters. resistance between the windings. Some of the small caps like C48 might be leaking. R58 is a 100K resistor from the grid of V8 (the sound IF tube) to ground. It would seem impossible for a 3.3 pf cap to be leaky, but this whole problem seems impossible. Ungrounding the grounded end of the secondary of L20 would also eliminate any possibility that C58 could cause the low voltage and signal. If C48 were leaking then it would probably get warm or hot. I have watched this tread on & off. What exactly is the symptom at this point ? From the last 2 pages it seems to be "have raster but no audio or video". That symptom is not rocket science. At worse there are 2 separate "major" problems. 8 pages to maybe find it. BTW I know you have a scope & meter. Do you have any other test equipment ?? I don't have any other testing equipment besides what you have seen. I sent you a message about the schematic. I can also send it to anyone else that would like to help. The basic issue, as you say, is has raster, no video or audio. OK Craig I replied to msg. end HAS to be lifted. A few actually plug in. divide it to isolate the bad stage. We have a few tricks we can try without equipment. point not the way to go IMHO. His scope looks good enuf to see undetected video from the tuner IF out on. Thinking was to divide & conquer at 3rd IF to narrow things down. It looks like there is a signal coming from W1 (although it's a bit orderly, which seems somewhat odd to me). These two photos show a 10X increase to W2 over W1. Maybe I did something wrong when measuring that W1 form at Pin 2 V6. I can't tell what your volts/div settings are in those 2 pictures. So I can't tell what voltage you are measuring. Looks to me that W1 was measured at 0.2 V/div, which would put it at about 0.5 Vpp.? At any rate, am I correct that R3, R43, R48, R49 and R50 have been checked? Is the 260 V correct at the brightness control R7? What is the voltage on the CRT pins 2, 10 and 11? like 70 Vpp instead of 45 Vpp. (clicked) so that the voltage readings are accurate. This link shows what you want to see for composite video. It may be flipped over. Note it shows 2 lines of video, thats traditionally done & also in Sams that way. You must adjust the time on the scope to get it that way. Use the red knob to tweak it. When you get it right make a note or mark the scope TVH ( for TV horz ). Above the dotted line is the video & on regular programing moves around. White is up black down. it wont reach the CRT. If you have a generator the pattern will make more sense. Below the line is the horz sync pulse & the color sync pulse.
. Use the red knob to tweak it. That is the red knob on the time display control. Thanks zeno. I had tried to find similar info on YouTube showing a scope display but had no luck. Getting out my magnifier, it does look like the waveform at W1 is about 0.5 Vpp. And the waveform at W2 looks to be 6 Vpp. And the signal looks nothing like a video signal. But in an earlier post the signal at W1 does seem to be 2 Vpp and does look like video. So perhaps in these latest photos the digital converter used to source the signal to the antenna input is not set up correctly. Anyway, about a gain of 10 in the video output tube. But with voltages that low we could be seeing junk signals being picked up by stray coupling. Some of what I see in those waveforms looks like hum from the power supply. The schematic indicates that we should be seeing a gain of about 25. I'm back from a few trips and finally had some time to take a fresh look at the feedback. I wasn't exactly sure how to test it except to put the multimeter leads on it in the continuity test mode. I didn't hear a beeping signal, but the meter gave me a reading of 1.7V one way and .22V the other way. Can I get a replacement for this on Mouser? The schematic shows that it's a CK706A. Did you disconnect at least one side of the diode? Be careful, these things can be damaged from solder heat. something like the 1K or similar. a 1N60 that would be better. It does not have to be a germanium diode, a silicon signal diode such as a 1N4148 will work just fine. Even considering it's in circuit and you are also measuring the diode load, it doesn't look healthy to me. 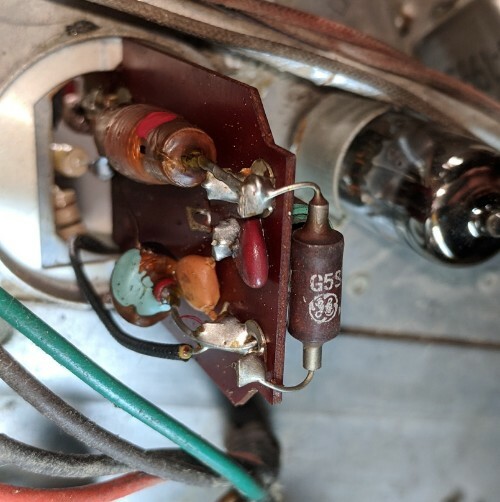 Germanium diodes were vulnerable to damage caused by flashovers in the video amp tube. I actually disconnected the diode completely to test it where I received those readings. Just trying to confirm the right replacement for this. Seems 1N60 is correct. Because voltage is 150V coming out of upstream tube, would the 200V one be best? when you reversed the meter connections and that is practically the definition of a diode. when looking for a short or open. Second the signal level the diode sees is not a high voltage. It only sees several volts across it. I think you are wasting time and money replacing things that are fine. Is it always true that you are using a 10X scope probe? Is the red CAL knob turned all the way until it clicked? Have you adjusted the scope probe compensation using the test signal on the front panel? You were getting good size video signal into V6 at one time, what could have happened? have one of those, then feed that into the TV antenna terminals. Here is a TV RF modulator.